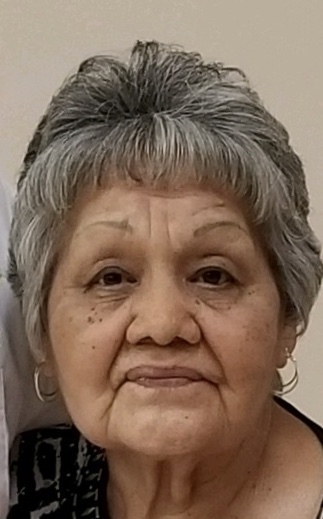 Alma A. Vasquez, 76, a resident of Silver City was called from this earth by her Lord and Savior on February 11, 2019 surrounded by her loving family. The Holy Rosary will be held Friday, February 15, 2019 at 6 o'clock in the evening recited by Deacon Bill Holguin. The Mass of Christian Burial will be celebrated Saturday, Feburary 16, 2019 at 10 o'clock in the morning at St. Francis Newman Center Parish with celebrant Fr. Bartholomew Ezenwelem officiating. Concluding services and burial will follow at St. Vincent de Paul Catholic Cemetery. She was born on December 5, 1942 to Avelino B. Altamirano and Eloisa Villa Altamirano. She was predeceased by her loving husband Ruben Sr. of 55 years. Alma was a very strong, loving, caring and devoted mother to all her children. She worked very hard throughout her entire life in order to provide the best life possible for all her children and even through her toughest struggles she never complained always making her children her top priority. She was also very dedicated and gave the best care possible to her special daughter Mindy, whom she always said was her special gift from God. She was very proud of all her children and their accomplishments. Her greatest joy was to be around all her grandchildren which she adored and loved immensely. She enjoyed playing Bingo and going to casinos. She also enjoyed sewing, crocheting and was very creative with any crafting project she undertook, always making sure she made any of her children’s or grandchildren’s special occasions as memorable as possible with her creations. She was a strong believer in her catholic faith and was a communicant of St. Francis Newman Center Parish. Her genuine kindness and unconditional love will never be forgotten, she will be truly missed and will remain in our hearts and thoughts forever. She is survived by her children, Josie V. Leyba of Carlsbad, NM, Ruben Vasquez, Jr. and his wife Mary Alice, Edward Vasquez and his wife Judy, Richard "Rick" Vasquez and his wife Linda, Amanda "Mindy" Vasquez and Elizabeth "Lisa" Vasquez and her companion Joe Gandara all of Silver City. Her grandchildren, Martin Leyba (Anna), Isabel Leyba, Alexis Rae Vasquez, Vanessa Vasquez, Izayden Vasquez, Michelle Vasquez, Renee Vasquez, Richard Ray Vasquez (Jandy), and Isaiah Vasquez-Gandara, her Great-grandchildren, Tommy Leyba (Naomi), Amaya Leyba, Armando Caballero Jr., Ailea Franklin, Asia Vasquez, Sophia Vasquez, Adriana Vasquez, and Miguel "Miggy" Vasquez, and one great-great grandchild Naleya Leyba. She is also survived by her sisters Petra "Pat" Molina and Matilde "Tillie" Vega (Oscar) of Tucson, AZ., Monica Dominguez of Las Cruces and Senaida "Cheny" Montes (Chuy) of Silver City, one sister-in-law Manuela "Nellie" Altamirano, two brothers-in-laws Adolfo "Dofie" Marquez and Rudy "Opie" Vasquez all of Silver City. Other survivors include her Godchildren, two extraordinary nieces who were excellent caregivers throughout her illness, Joann Ybarra and Ruthie Vasquez and numerous nephews and nieces. She was preceded in death by her parents Avelino and Eloisa Altamirano, her husband Ruben S. Vasquez, Sr., a granddaughter Ashley Nichole Vasquez, son-in-law Jesus Leyba and her brothers and sisters Antonio Altamirano, Isidro Altamirano, Ramona "Monchie" Moreno and Gloria Marquez. Serving as casket bearers are Martin Leyba, Isabel Leyba, Michelle Vasquez, Richard Ray Vasquez, Joe Gandara, Leo Mares, Rudy "Opie" Vasquez and Juan Padilla. Honorary bearers are Jordan Gomez, Tommy Leyba, Isaiah Vasquez-Gandara, Vanessa Vasquez, Chuy Montes, Adolfo "Dofie" Marquez, Peter Vasquez, Oscar Vega, Eddie Rangel and Bobby Rangel.